Labor day weekend and Leetonia was full of children having fun the old fashioned way. The six boys left to right are Timmy Shey, Lee Cassel, Owen Shey, Wyat Grundon, Casey Ahern, and Colton Cassel. 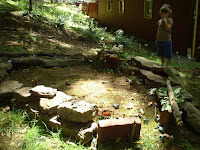 They construted two elaborate play forts. The first one being for action figures and the one in the second picture for civil war figures. 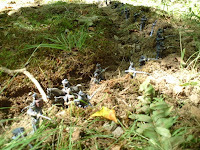 It appears several of the civil war figures were also trenched in for battle in the third photo. 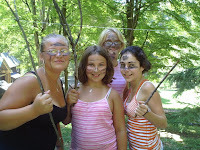 The girls: Kortney Ebersole, Hannah Ebersole, Madeline Grundon and Toni Ritrovito appear ready to do battle with some unknown foe in the Leetonia area. I hope for the boys sake they aren't on the list of foes cause these girls look serious. A combination of Ebersoles and Cassels surrounded a feeding table close to the Ebersole camp. I don't believe anyone starved during the weekend. 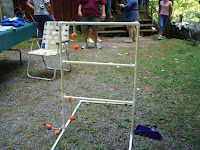 They also had a few games the adults participated in. A friendly game of horseshoes and a game called, "Bongo," which looks like something a golfer made up to use up his old golf balls. way through them and attached together with about 12" of rope. There are a total of 6 sets of these balls, 3 sets of one color and 3 sets of another color. The object is to stand at one end and rap the balls around the horizontal bar. The top bar is worth one point, the middle two points and the bottom three points. I don't have a copy of the rules for winning the game, but I am sure you can make up your own. I tried it for a bit and it seems very addictive. The last picture shows one of the PVC racks. The upper area of cabins seemed full of people for the weekend. The Anthracite Camp of Fred and Judy Wise, were busy repairing inside their cabin as they had just finished putting on a new steel roof this summer. I will post some more Labor Day Weekend pictures tomorrow as there was just too much going on for one post. Hope you all had as much fun as they did in Leetonia this weekend. Mountain girl, Paula, logging out. Here is another fun picture from the Red Rock collection. 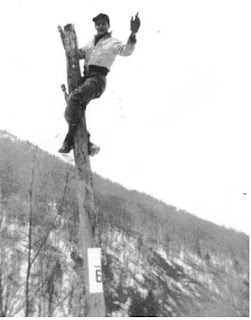 This is Gene Garber climbing a telephone pole on Leetonia Rd. near Leetonia. This was taken in November, 1947. Looks like a cold day to be up in the air. I notice he doesn't have any safety equipment. Must have been before the days of OSHA. I don't even see any spikes on his boots. It is obvious that climbing a pole for Gene was second nature. I don't think we had electric at this camp until sometime in the 50's a fact I will have to check out. But it had to be close to that time they even had electric back here. This could possibly be one of the first poles to bring electric to Leetonia. Times have definitely changed fast. We didn't even have a phone here before 2002. I remember making the first call to my brother in LA and we were both so shocked we could call from the cabin to anywhere. I added the internet and the cabin seemed to jump a century in technology. We still can't get cell phone reception, which more than challenges some people. But when I see people in town glued to them like they were a second appendage, I am sure being out of the cell phone reception area is a good thing. Everyone is up at their cabins this weekend for Labor Day and I hope to get a few pictures to share with you of all the goings on. Mountain Girl, Paula, Logging out. 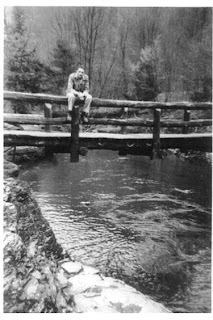 This picture was taken in the Spring of 1948. Clair Amand from the Red Rock Camp is sitting atop the foot bridge over the swimming hole. I know there are some of you who remember this bridge and I am looking for more information about it. I assume the CCC probably built it...but when and when is the last time anyone remembers seeing it? It looks like it would be fun to hang your legs over the cold spring water and watch the trout scurry underneath you. I have seen a few brave people swim in April, but you have to be a polar bear to do it. In fact, this water never gets real warm even in the heat of summer. It still draws a crowd on the weekends for a cool dip on a hot day. Thanks to Red Rock for the picture. Mountain Girl, Paula, logging out. I am not quite sure how the door started, but I remember it was my Grandmother's idea to start measuring the five grandkids every year when they came up to camp. The door hung at the bottom of the stairs about 5" off the ground, which allowed lots of room to measure growing kids. Although kids weren't the only thing that got measured the family dog, parents, grandparents and a few friends of the family made the door. The door was taken off at least twenty years ago when the stairs was remodeled and no longer needed a door. The latest date I found on the door was 1974 and it measured my ex-husband Bill. Coincidentally it is the tallest measurement at 6'2". The shortest human measurement was my brother, David, who in 1966 was about 35" tall. I seem to have the biggest one year growth spurt in the family of 5 1/4" in one year between 65 and 66(I was 12-13 then). I think I was the skinniest for my height the next year at 94 lbs and 5'31/2" tall. I am the only person to have a weight recorded as well as height, so my grandmother must have thought it noteworthy as well. I know she worried about me eating enough and was always trying to feed me. Grandma being a farm girl figured something wrong with you if you didn't eat eggs. I hated eggs so she devised ways to get me to eat them. Not the least of which persists today adding chocolate chips to hard boiled eggs. I pretty much gross people out when I do it. But I never liked the taste of the white part of the egg and that covers it up. Many camps have diaries we have a door that tells a story of the growth and visits of five grandchildren to their grandparents camp. I am not sure what to do with the door it is starting to fall apart like all things made of wood. It is large and difficult to display. I was all ready to turn it into a shelf in my garage when a tinge of guilt seemed to make me stop. Are the pictures of it enough to carry the memory? There seems to be something mystical about touching it. You can feel yourself standing next to it with a ruler on top your head and a relative marking a line in pencil. When you turn around there is always a comment about how much you have grown. If you are the youngest one you look up at your brothers or sister and dream of catching them, especially after you pass a few of their early marks. For my youngest brother, David the dream of catching the others was lost when the door came down long before he could make a high enough mark on the wall. If you have any suggestions as to what I should do with the door...let me know. I have decided to use a different old door for the shelf for now. One that doesn't talk back. Mountain girl, Paula, logging out. Thought I would share my brace decoration. The eagle is lifting my broken body out of the creek. I wish it had been that easy. Today I cut and froze about 5 dozen ears of corn given to us. Brad also brought a bunch of garden goodies up today and I will be enjoying tomatoes, potatoes, peas, squash and a couple things I am not quite sure of. I am blessed to have so many friends making sure we don't starve. I am spending some time reading and organizing my life. I usually don't have time for either especially the organizing. The garage is my biggest project. With a dirt floor it is a challenge to use the space without getting your stuff damp, or frozen to the ground. I put up some shelves and Lee has been moving things back and forth. I am also eliminating things I haven't used for a long time. I found a dead squirrel? I think, since it was mostly fur and squirming worms. EEEck. Nothing like gross stuff to clean up. But the garage is not varmint proof either. Porcupines, squirrels and barn swallows are in a constant war with me for the space. Seems like the carpenter needs to build herself a new metal garage with a concrete floor. Well, I can dream. Mountain girl, Paula, logging out. 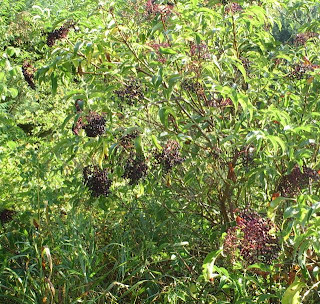 I was reminded by Fran to send you a picture of the elderberries. My grandmother used to make jam from them and I have had others who have made pie and wine from them. It seems they are usually ripe around Labor day, but different plants ripen at different times. As you can see from the two pictures taken from plants less than 20 foot apart the first one is still green and the second turning red. second they get ripe so you have to be ever so vigilant. I have been motivated by Fran's email to try a pie this year. The tartness of the berries lends itself well to such a pie and according to Fran they are wonderful. So this will be a first for the mountain girl I will let you know how it turns out. The apples on the property make the world's best apple pie for the reason of their tartness so I am thinking the same will be true of the elderberries. 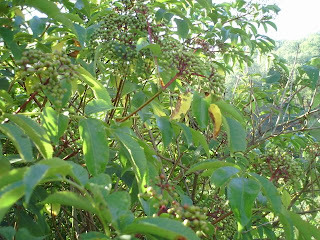 The apples won't be ready until October so the elderberries will be a nice fill in. I think being in this brace has given me a sweet tooth lately. Something I hope I am not sorry for when I have to get back into shape. Mountain girl, Paula, logging out and looking forward to an elderberry pie. The Shover Family came up today to visit me, from left to right Dave, Carolyn, Jeremy and Taryn. 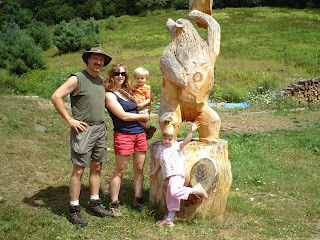 I am not sure if Taryn was imitating the Bear Carving, but it was very creative. Both kids received a Turkey feather and Taryn got to see a small snake about the size of an earthworm. I'm not sure she was too thrilled about it. They drove up to the top of the mountain to see my million dollar view and although I didn't talk to them afterward, I am sure they were as amazed by it as I am on a regular basis. 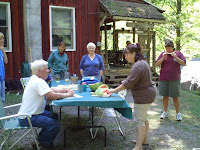 Thanks again to John and Lois Sauers who also stopped by with some fresh vegetables. I already ate two ears of corn and they were delicious. 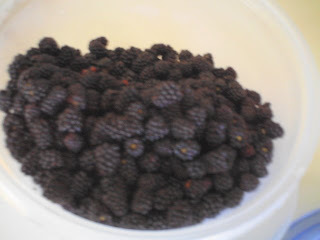 My blackberry pie didn't last long and I am so tempted to go pick some more if it weren't so hot today. I am afraid in my turtle shell I would bake quicker than a pie for sure. Also to all of you who have been supportive in so many ways I can't list...the Mountain girls thank you. Back to my garage straightening. Lee is my lifter and I don't think she is too thrilled about this project. The Barn Swallows made a real mess in the garage and I must find a way to keep them out next year. Mountain Girl, logging out, and straightening up in Leetonia. It's that time of year and the wild blackberries are numerous on the mountain this year. It takes a while to pick a pie's worth especially for me since I am a little more limited as to where I can climb this year.But a nice patch was close to the road on the way back to our pond and not much climbing was involved. There are numerous spots were the bear have pushed their way through the scratchy plants to get their share of the tasty fruit. Bears don't seem to digest fruit well and when they eat the berries it comes out looking much the same as it went in only in large mushy piles. The piles are to be avoided stepping in and slipping. The smell and stain of the reprocessed berries are not pleasant. While picking the berries I am keenly aware of the bears love of them and keep an ear and eye open. For such large creatures they can be amazingly quiet while eating and walking. Usually when finding a bear it is as much shock to him as it is to me. The bears so far have scooted off quickly at the sight of me. 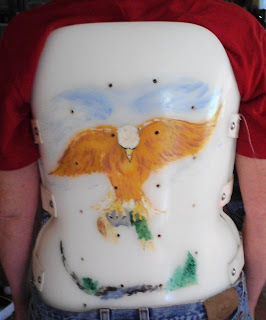 Although, in my turtle shell brace I do feel a little more vulnerable especially after Leo got smacked this June. Not the first time I have seen a black bear act aggressive but it was the first time they have challenged any of my dogs. Well, it got down to 36 degrees last night. It is gradually creeping toward the freezing mark. I am sure my neighbor Mick has a fire going this morning. He seems to like it warm and he loves to cook on his cast iron stove. Lee is like a polar bear to her the weather is just right. I know I will be wearing a sweatshirt long before she agrees to start a fire in such warm weather. I am planning on making a pie out of these berries today and enjoying the fruits of the forest. Yesterday in Wellsboro, Pa some young adults were stopped on a traffic stop. They were dressed in Camo with 2-way radios. Not unusual for hunting season here. But it raised suspension enough to make the police take them in for questioning. It didn't take long before at least one of them admitted to the crimes and told them where the loot was being kept. It was at the house of an older female relative(who has also been arrested as an accessory to the crime) and I guess there is a lot of it. They currently believe these young adults have been responsible for robberies and vandalism in three counties: Potter, Tioga, and Lycoming over the last ten months. Most recently it has been in our area the last month. They knew the roads well and kept lookouts with 2-way radios to warn them if someone was coming. For the most part they knew when people would be gone and concentrated their efforts on the cabins they knew would be vacant. The stealing of the 4-wheeler from my neighbor may be their undoing valued at over $5000 that alone is a felony. They aren't sure if there are more people involved at are continuing to question the suspects. For now we can all breathe a little easier knowing at least one group of bandits have been captured. Last week my neighbor's cabin fell victim to the break-in's and his newer 4-wheeler was taken. The good news is they found it yesterday along with several other stolen items and are getting ready to arrest the people responsible. Yeah! We are hoping these are the ones responsible for all the break-ins but only time will tell. I will let you know if I get anymore information on an arrest, but for now at least a little justice is on its way. NOTICE: Anyone missing items contact the State Police at 570-662-2151 or Brian Caldwell at 570-724-2868 immediately. Today I spent time resting under the Grandmother Tree, a 200 year old White Pine that is 15 feet in circumference about a hundred yards from our house. I affectionately call her, "Oni", which means Holy One. I took a blanket, pillow and a book resting my head against the base of the tree, I spent the first hour looking and listening. The day was again pleasant, 70's, cool breeze, bug population low. Scooter and Leo followed me to the tree thinking they were getting a long walk and were disappointed to see me lay down. Leo hung around for a while and then disgusted went home to rest on the soft couch inside the cabin. Scooter wasn't sure what to do. At first he just circled me and licked me to encourage me to resume the walk. Then he took his frustration out on local sticks and roots pulling and chewing them up. After a while he went home as well to see where Leo went. Scooter being young and insecure about seeing me laying there returned a half dozen times and until he gave up on me as well. Alone I listened to the sound of a hummingbird whistling by within a foot of my head, bugs buzzing and birds chirping. Then a Red Squirrel approached on the branches above me, chirping and shaking his tail at me. I could almost imagine he was saying, "What is this? Why are you sitting under my tree?" He ventured down the large trunk within eight foot of my head. I wondered if he was brave enough to come all the way down. About that time Scooter reappeared and the squirrel quickly disappeared. Another licking from Scooter and he left again. Mister squirrel reappears and gives me the same message of disapproval. This time he does not come as closely perhaps afraid of the return of the large fur beast. "What are you doing?" I asked him as he chattered back with probably the same statement. It would really come in handy to speak squirrel I thought. The clouds moved quickly across the sky blotting out the bright sun cooling the air. No feel of rain in the air so I settled back again. It is a rarity, I could spend such a moment this time of year, since I usually work everyday during the summer months when I am healthy. This after all is my busy time of year, much to be done, firewood to cut for the winter, projects to be finished. But not this year. This is the year the mountain girl has been tamed for a season by an unforgiving corset of plastic holding my spine in place while it heals. I looked at the clock this morning at exactly 11:15 am and thought seven weeks ago I lay at the bottom of a 53' fall in my vehicle, listening to the sound of my breathe drowning out the sound of my car engine still running after flipping four times and landing in the creek. Feeling the burning pain in my back wondering how badly I was hurt. I felt pain and I knew I was alive. Pain is good. Now I lay peacefully under my favorite tree thankful to all who have helped me to rest and heal with their support, spiritually, financially and emotionally. Although, I would never wish for anyone to come as close to death as I did. It has been a enlightening experience to see such love given freely. Now I hear the squirrel chatter, the bird chirp, the wind blow and the dog lick me in the face. It is truly wonderful to be alive in Leetonia today. Mountain girl, Paula, logging off. P.S. 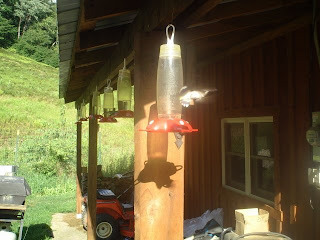 I was informed by Lee the adult male hummingbirds have exited South. We only have juveniles and females left and they are very hungry. During the last week you could feel something different in the air. The wind came out of the North and the air lightened up a bit. I awoke this morning looking out at the heavy dew on the yard imagining the grass bracing for frost. It was 43 degrees on the thermometer, but the animals know more about the seasons then temperature. The barn swallows have finished raising their young and developed them into strong fliers for a journey, South to start in the next two weeks. The hummingbird young are struggling to catch up eating a whopping 2 gallons of sugar mix a day, nearly 10 lbs of raw sugar a week on Lee's eleven feeders. Often she is out twice a day to keep them satisfied. Thanks to John and Louise Sauers gift of 25 lbs of sugar we will finish the season without a hitch. By the first of September the male hummingbirds will leave, then the females and then all we will see is travelers until about the 3rd week of September when the hum of wings will cease until next May. People who stop in during hummingbird season are amazed by their numbers and their bottle rocket like sound as they whiz past your head. There is something about this place they love and it seems every year their numbers increase as does our enjoyment with them. Today was a perfect day in Leetonia. Many camps were overflowing with people enjoying the dry, picture perfect day. They breathe in the fresh air to restore a bit of sanity before returning to the bustle of their lives in busy cities. There was a full moon last night watching sentry over a clear, cool night. The kind of night you can walk outside without a flashlight and feel a connection with all of the forest's night creatures. As we drove home last night, one of these creatures an owl, dove quickly across in front of us to grab a small meal and then retreated into the darkness. The bears roamed around to check busy camps in search of illegal handouts. Bear become like docile dogs getting a bisquit, to the delightment of campers and the fear of rangers, who often must deal with the problems this causes. But who doesn't want to see a 300 lb. bear 15 feet away while holding their young child. Only a sane person who isn't lulled into thinking this giant predator eating peanuts and marshmallows is harmless. Such is the way of the woods and its visitors. Mountain girl, Paula, enjoying each perfect day of summer while its here. Windows and a shed door were pried open at Cedar Crest for the second time in the last couple weeks. 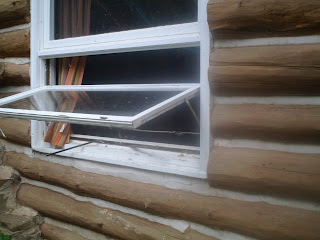 Reports of a cabin on West Rim being broken into as well either Sunday evening or Monday. Remember to report cabin break-ins immediately to the State Forest Ranger if your cabin is on leased land or the State Police if you privately own the land. As reported earlier a dark-colored heavy duty pickup with several boys ages late teens to early twenties were seen by one camp owner. All suspicious vehicles should be noted with make/model/color and license plate number. Do not attempt to apprehend anyone yourself regardless of how tempting it may be. It is easy to be wrong and hurt someone as well as be right and get hurt yourself. We have so many good and kind people up here that I would not let a few bad boys change your mind about the woods. Let's just all keep an eye out for our neighbors. 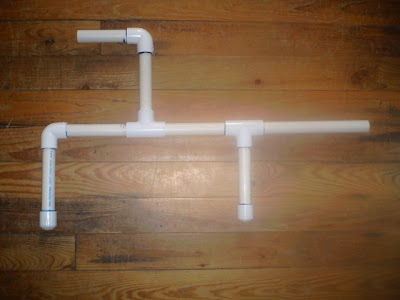 :) I realized I never got around to telling you how to make these great marshmallow guns. I had the grandkids make these during our family reunion this year and they were quite a hit with the adults as well as the kids. Now using PVC glue assemble as soon. You may want to precut the pieces if you are dealing with very young kids, otherwise let them cut their own with a hacksaw. Sand off any rough edges. Get a bag of mini marshmallows and insert into short tube, give a good strong burst of air and have fun. If you get any stuck that you can't blow through with an additional marshmallow, run hot water through the tube to clean it out and let it dry good before using again. The less the kids touch the marshmallows with thier mouth the less chance they will get wet and stuck. Also permanent markers are great for letting them add their own personal touches to the gun when it is done. There were quite a few imaginative guns made at our reunion. Some of the builders even gave their guns names. You can set up targets. Shoot each other. Form teams and play war. We did adults against the kids and you had to get hit 3 times before you were out it was lots of fun. If you are doing this at camp make sure you do it in an area you don't care about the bears showing up for clean up. I have also tried some variations to this design and it seems you want at least one turn to build up pressure, but other than that let your imagination go you can even make one that shoots around corners. Handy for the war game. Mountain girl, Paula, Logging off and playing like a kid. Numerous cabin break-ins reported throughout the State Forest. It appears that stealing of cooper and malicious vandalism occurred during the last week of July. 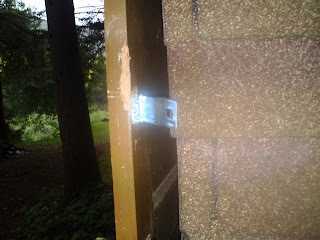 Vandals gained entrance by using a large pry-bar and then a chain saw they stole from one of the cabins. Cutting directly through the door openings. James Losinger, Forest Ranger, has been busy trying to put together all of the pieces. A suspicious dark colored heavy-duty pickup was noticed by some of the camp owners. More and more reports of damage come in as owners or caretakers find damage. Camps on private property should report damage directly to the State Police. 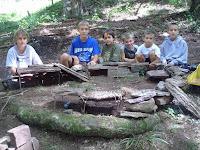 Camps on leased property should report damage directly to the DCNR. Please do not repair damage until the proper authorities can investigate and refrain from disturbing the immediate area. Camp owners and visitors to the State Forest are requested to take notice of suspicious activity. Careful descriptions and plate numbers will help put this to an end as quickly as possible. At this point in time at least 20 camps have been broken into with a large number in the Leetonia and Stony Fork area. Today I was blessed with a visit from Harold Zook. Harold is a founding member of the Red Rock Camp and has been coming to Leetonia since he was a teen. Harold is in his 80's so this represents a lot of history. I will be getting some more information from the Red Rock members, which promises some interesting pictures of the old swimming hole by the Nightengale Camp. Of most interest to me was the fact, Harold had stayed in our camp on at least two different occassions: Once while owned by the Lowes and a few times when my grandfather, Paul Maholm owned the camp. Harold remembers coming up in his late teens to hunt and staying with the Lowes. "They were poor people," Harold recalled. "They fed us burnt bear meat and apples for dinner and one of their oldest son's was our hunting guide." Harold remembers how cold it was out hunting and how little the Lowe boy had to wear. "He just had overalls and rubber boots on, I don't know how he could do it." Harold remembers the hunting was good. The deer were plentiful back then. He said the Lowes farmed the top of the hill and put potatoes in. "It seemed like there were more rocks than potatoes in that field." When the Lowes sold the place to my grandfather for $800.00, Harold said. "I was young and didn't have that kind of money or I would have tried to buy it." It is wierd to think how one person buying a property over another changes all of history. If Harold had brought this property, I would never have lived here. There would be no mountain girl of Leetonia. Later, after my grandfather purchased the place he rented it to Harold to hunt out of. Harold said they just about froze to death trying to keep the place warm. The single pane glass frosted over and they could see their breath. They brought up an extra stove the next year only to find out the chimney was plugged and they again had to suffer a cold hunting season. Harold recalls, "I was younger then and it didn't seem as bad to me as it would now." Harold ended up buying the Red Rock camp with some other guys and started their own history there. Hopefully, I will be able to fill in some detail on the Red Rock later. UPDATE: Last week multiple camps experienced break-ins from Jersey Shore all the way up Leetonia Rd camps were broken into. Seems they looked for guns, propane, and cooper pipe. Many camps found themselves repairing things this weekend, instead of enjoying a vacation. A pry bar was used to open windows and doors. Camps broken into that I know of at this point coming up Leetonia Rd are: Bobcat Camp, Carpenter Camp, Red Rock and Nightengale. Don't leave your guns at camp. If any of you have camera's you can mount which take pictures without being noticed. It might be a good idea. Maybe we can catch these people. Just thought you all might like to see the contraption I get to wear for the next couple months. I of course added some abs to the front and a few things to the back to keep it a little more fun. This turtle shell doesn't allow bending and sitting is difficult unless you lean forward. It also heats up fast in direct sun. You sort of feel like a clam bake. I have to wear pants about six inches to big to get over it so I look like a large duck blind with the camo pants on. Patience is not one of my virtues, so I guess this is what I must learn. For there is no work, driving, or much of anything you can do with this on. Thanks for all the support many of you have sent. It is a difficult journey to go from being so independent and strong to so dependent this quickly. It has given me a great opportunity to see the love and compassion of others. I will say the news media distorts our view of humanity so much one never realizes the vast goodness out there until something like this happens. You also don't realize how many things you took for granted when you can do everything. I will be doing some work today, sorting through my tools that were scattered everywhere during the accident. Of course with the help of Lee, since I am not allowed to lift more than 5lbs. I never realized how little 5 lbs. is. Thanks again to all of you. Mountain girl, Paula, logging out.